Problems with test vehicle: Near the end of our test loan, the driver’s-side interior door handle mechanism broke, rendering the driver’s interior door handle inoperative. Exiting the vehicle from the driver’s seat required lowering the driver’s window to open the door using the exterior door handle, restarting the vehicle with the door open (the engine shuts off automatically when the door is opened, which cuts power to the vehicle’s accessories–including the power windows), closing the driver’s-side window, turning off the engine, and closing the driver’s door. Volvo’s premium compact crossover SUV, the XC60, is a little less compact for 2018. It’s also somewhat different looking than before, and it’s more powerful too. In other words, it’s been redesigned. Consumer Guide® got to test an ’18 XC60 T6 with top-level Inscription trim, a $63,290 vehicle after an extensive list of options and delivery were factored in. While all that makes for an inordinately expensive compact SUV, the XC60 does provide fine passenger room and it’s pretty lively with the T6 powerplant. 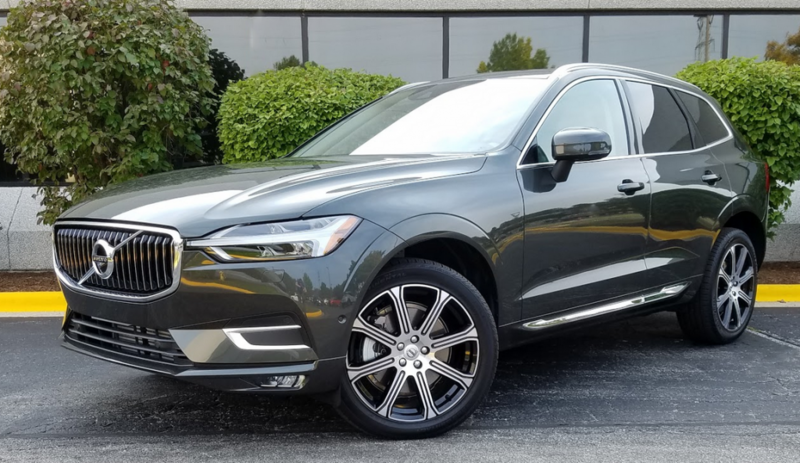 Exterior features of the XC60’s Inscription trim level include chrome lower bodyside trim with a debossed “Inscription” logotype, illuminated door handles, and integrated tailpipes with a body-colored lower insert. Inscription equipment adds $3800 to the bill for an XC60 T6, which starts at $44,900. Specific appearance features include 20-inch alloy wheels, chrome grille bars and bodyside trim, oblong exhaust outlets in a body-color trim panel, illuminated door handles, and LED front fog lights and cornering lights. Interior upgrades count driver and front-passenger seat-cushion extenders, driftwood inlays, and a tailored dashboard covering. Conveniences run to a 12.3-inch driver-control display with individual dials for speedometer and tachometer and a central programmable information readout, navigation, drive-mode control, 4-zone climate control, keyless entry, high-level interior illumination, storage net on the passenger side of the transmission tunnel, a cooled glove compartment, and a hands-free tailgate. All of that is in addition to more items handed up from the base Momentum trim level, some of which we’ll mention in a bit. The Volvo XC60’s cabin is outstandingly luxurious in Inscription trim, especially when outfitted with the Nappa leather and other features included in the $3000 Luxury Seat Package. Rear-seat room is good for average-sized adults. The T6 engine is Volvo’s 2.0-liter 4-cylinder with the added boost of both turbocharging and supercharging. It now makes 316 horsepower at 5700 rpm, up from 302 horsepower previously. (The turbo-only T5 engine gains 10 horsepower for a rating of 250, and the new hybrid T8—the T6 engine with a rear-mounted electric motor—develops 400 horsepower.) In tandem with the 8-speed automatic transmission, the T6 steps off from a standstill quite well, and has more than sufficient power to ply expressways at speed. Timely transmission kickdown eliminates any drama in passing or highway merging. However, if you rotate the drive-mode switch on the console from default “Comfort” to “Dynamic,” accelerator inputs are met with a crisper, almost spiky, response that propels the XC60 in a real hurry. 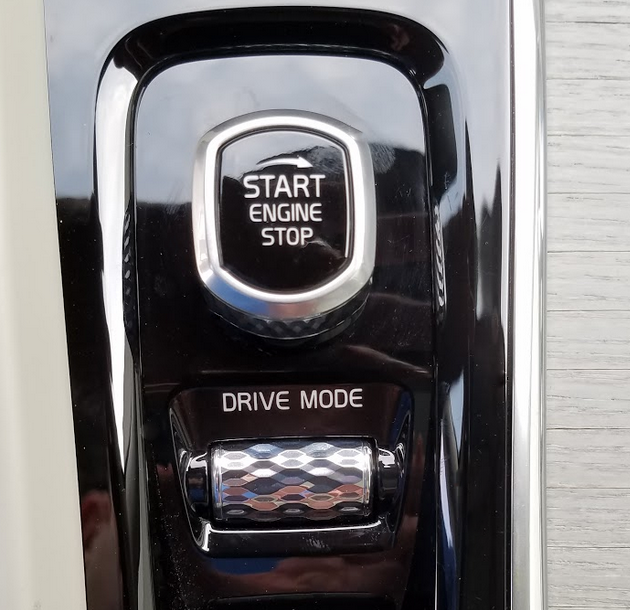 Most new Volvos have an unusual on/off switch that takes some getting used to–it’s a twist knob mounted just aft of the shifter on the center console. Another of the available settings is “Eco,” which tones down performance a bit to save some gas. At 21 mpg in the city, 27 mpg in highway driving, and 23 mpg combined, EPA fuel-economy estimates are one mpg better in city and combined operation than they were in 2017. However, in a run of 178 miles that was 71 percent city-style driving and mostly in Comfort mode, this driver recorded just 18.3 mpg—and that was just fractions better than he got from a ’17 XC60 T6. With the redesign, overall length grows by not quite two inches, but the wheelbase is stretched by 3.6 inches to 112.8. While the latter extension pays some dividends in rear-seat legroom, it also stands to smooth out ride quality somewhat. The XC60 handles easily for the class, and it stops promptly. All-wheel drive is standard throughout the lineup, and optional 4-corner air suspension changes suspension firmness and ride height depending on the driving mode that’s been selected. A new standard safety technology is “Oncoming Lane Mitigation,” which will steer the vehicle back into its lane if it crosses the center stripe when an oncoming vehicle is detected. Others included in the base price are City Safety collision-avoidance, forward collision warning and mitigation, lane-departure warning and mitigation, drowsy/distracted driver alert, and road-sign information. A raft of other watchdog technologies is available at extra cost, many of which were added to CG’s test vehicle. A new one is “Steer Assist,” which helps drivers avoid obstacles by adding additional steering input if necessary and braking individual wheels to increase vehicle control. Passengers enjoy a comfortable, attractive, and well-executed cabin. Leather-clad seats with 10-way power adjustment in front are standard. However, the test vehicle had the Luxury Seat Package with Nappa leather. Seats in this package are heated and ventilated in front (and heated in the rear), and have massaging backrests for the driver and front passenger. In addition to the Inscription’s premium dash trim, door panels wear padded or pliable surfaces all the way down. Fairly large windows provide good vision to the front and rear corners, but roof pillars that are kind of thick reduce side views somewhat. A panoramic moonroof with a power-retractable shade lets in plenty of sunlight—or moonlight. There’s real adult legroom in both rows, and headroom is good all around. The XC60’s nicely finished cargo area measures 37.8 cubic feet behind the rear seats and 68.8 with the rear seats folded. Occupants can stash their take-along items in a large glove box. The volume of the covered console box is quite limited, but front door pockets are long and segmented to each hold a bottle. Cup holders reside under a door in the console. Rear-seat occupants have smaller door pockets, and net pouches on the backs of the front seats. Cup holders spring from the pull-down center armrest, which also has a small covered bin. The tradeoff for the extended rear-seat legroom seems to have been a slight diminution of rear cargo space. Overall, it’s still pretty good, and it gets better when the 60/40-split seats are down. The seats fold flat and present a smooth transition from the cargo area. A central pass-through for long items is built in behind the rear-seat armrest. There’s certainly more to the Volvo XC60 than there was before. If you really want one, the trick is to keep from giving everything to the folks who sell them. 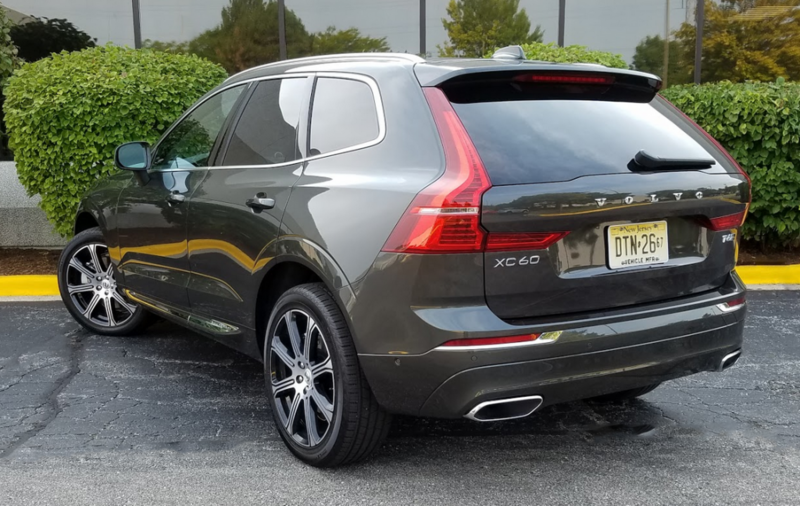 The redesigned-for-2018 XC60 offers good passenger and cargo room, a satisfying driving personality, a good selection of safety and technology features, and a truly regal cabin, especially when optioned up. However, a heavily optioned XC60 easily pushes past the $60K mark, where it doesn’t strike us as a strong value proposition. Written by: The Daily Drive staff on October 5, 2017.on April 17, 2018.